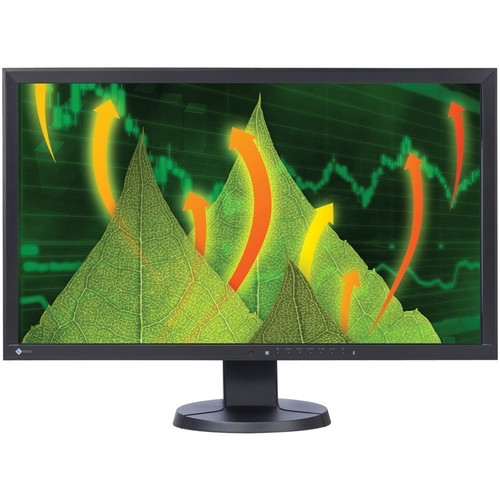 The black FlexScan EV2736WFS 27" Widescreen LED IPS Monitor from Eizo is an LCD monitor with ergonomic and eco-friendly features that make your office and business work more comfortable while keeping power usage in check. The slim bezel design of the monitor saves space on your desktop. The LED monitor has an IPS (In-Plane Switching) panel that provides 178° viewing angles, so it exhibits minimal change in contrast and hue when viewed from off center. The versatile stand offers height, tilt, and swivel adjustments as well as portrait mode display. The monitor is equipped with two input terminals (DisplayPort and DVI-D) and two USB 2.0 ports to facilitate quick and easy connectivity to peripheral devices. 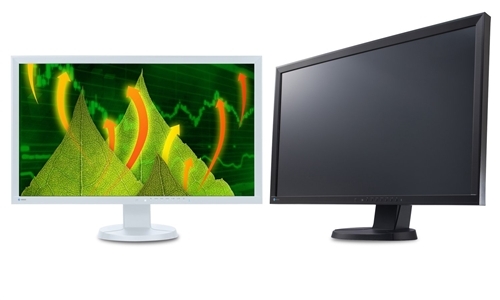 The LED backlight monitor lasts longer and consumes less power compared to conventional CCFL backlights. The thin bezel design saves space on the desktop and minimizes eye movement between screens in a multi-monitor environment. Adjust the screen to the most comfortable angle and reposition it to show your colleague or client. The monitor comes with a versatile stand that offers height, tilt, and swivel adjustments as well as portrait mode display. Three input terminals (DisplayPort, DVI-D and D-Sub) are included for connecting to PCs. In addition, a USB hub and headphone/audio jacks are conveniently located on the side of the monitor. Due to the way brightness is controlled on LED backlights, users may perceive flicker on their screen which causes eye fatigue. The FlexScan EV series utilizes a hybrid solution to regulate brightness and make flicker unperceivable without any drawbacks, like compromising color stability. The IPS (In-Plane Switching) panel has 178° viewing angles, so it exhibits minimal change in contrast and hue when viewed from off center. This makes it ideal for trading rooms or other multi-monitor environments. To prevent eye fatigue, a brightness sensor called Auto EcoView detects the changes in the ambient brightness that occurs throughout the day and automatically adjusts the screen to the ideal brightness level. Furthermore, Auto EcoView reduces power by almost 40% compared to operating the monitor at maximum brightness. In a dimly-lit work environment, a monitor with low brightness settings would be more comfortable to use. With typical CCFL backlights, the lowest you could adjust to would be a much brighter 20%. However, this monitor comes with an LED backlight that allows for adjusting the brightness to just 0.2% (about 0.6 cd/m2) of the maximum. Five preset modes (including two with user-adjustable settings) ensure you always get the right setting for any application. You can switch modes at the touch of a button or automatically with the bundled ScreenManager Pro for LCD software. The Paper mode simulates the look of printed paper and helps prevent eyestrain when reading documents. When used with EyeCare Filter (available with the bundled ScreenManager Pro software), any of the several filter patters that resemble different types of paper can be applied. You can adjust the density of the filter patterns for maximum viewing comfort. An overdrive circuit reduces gray-to-gray (GTG) response time to just 6 ms to ensure that moving images look clear and sharp. The LED backlights last longer and consume less power compared to conventional CCFL backlights. They are also mercury-free and have minimal impact on the environment when they are eventually disposed of. A presence sensor called EcoView Sense 2 prompts the monitor to switch to power save mode when you are absent and then power on again when you return. It even works in a multi-monitor setup, so all monitors remain on when you're at your desk. The FlexScan has passed TCO Certified Displays 6.0. It also complies with other stringent international labels for ergonomics and energy savings like EPA Energy Star and EcoSense. Pixel Pitch 0.0092 x 0.0092"
Box Dimensions (LxWxH) 28.5 x 20.5 x 12.3"